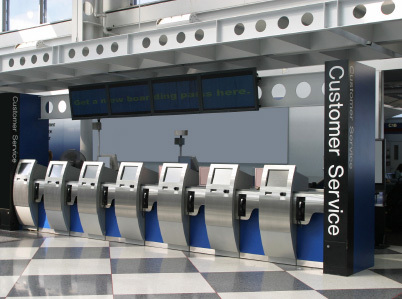 Are self-service airports in our future? As the automatic doors part, you step into your familiar old airport. Except it’s not familiar at all. Gone are the ticket clerks, baggage handlers, and other airline personnel you’ve long depended on to get you and your luggage to your destination. You walk up to a kiosk and check in for your flight by waving your cell phone at a laser, then drop your suitcase into a chute, and proceed to security. You’re ready to fly and it’s only been three minutes, but you haven’t interacted with a soul. While there’s no doubt new technologies could streamline the air travel experience, the totally self-service airport brings up a number of issues, similar to those raised by the introduction of rental robots at Hertz. For one, if there’s no one around to help when the machines break down, what do you do? I’ve had very little success with supermarket self-checkout lanes, and don’t even get me started on the voice-recognition software many companies now use to respond to customer phone calls. And are airline officials really interested in improving the customer experience, or is the prospect of cutting labor costs really behind this push to automate airports? I would argue that the current high levels of traveler dissatisfaction aren’t the result of airport staff being inefficient, but more likely due to an outdated air-traffic control system and poor airline policies for handling delays. Let’s hope the future brings more customer care, whether it’s from humans or gadgets.